Since the dawn of time, men have dominated the warring professions. Though women occasionally become warriors, rare are those who achieve the status of living legends. Most women combatants of great prowess are regarded with a strange mixture of adulation and trepidation. Some are hailed as heroes and peacemakers, while others are dreaded and spurned. The rare women who earn the title of Warrior Queens inspire patriotic vigilance and military ardor in others. They can rally entire populations to their cause and often lead massive armies into battle. The mythical deeds of the Warrior Queens are consistently sung all over the world and the names of these legendary figures are remembered long after their passing. 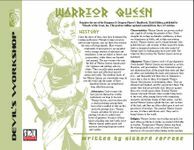 This four page Warrior Queen Prestige Class PDF is an easy-to-integrate PC class and just the sort of thing needed for DMs to add depth to any great d20 fantasy campaign world and gaming session.